The iMac Core 2 Duo 3.33 with 21.5-inch screen is a configured-to-order iteration of the iMax Core 2 Duo 3.06 21.5-inch introduced in late 2009. This is the all-in-one desktop computer in an all-aluminum unibody casing behind the 21.5-inch LED-backlit IPS screen, covered by an edge-to-edge front glass and mounted on an aluminum stand with a slightly tapered foot and an adjusting hinge. The “Core 2 Duo” 3.06 21.5” (late 2009) features a 3.33 GHz Intel Core 2 Duo processor (E8600), with two independent processor “cores” on a single silicon chip, 4 GB of RAM, a 500 GB or 1TB Serial ATA hard drive (7200 RPM), a slot-loading DVD+R DL “Super Drive”, an SD memory slot card reader, NVIDIA GeForce 9400M graphics with 256 MB of memory shared with the system, or ATI Radeon HD 4670 graphics with 256 MB of shared memory, a built-in iSight webcam and stereo speakers, as well as a Firewire “800” and 4 USB 2.0 ports. It also has built-in draft and enabled AirPort Extreme (802.11g) and Bluetooth 2.1+EDR, Gigabit Ethernet and Mini DisplayPort capable of supporting a second display. The cooling system is CPU controlled and the in-built speakers are mounted beneath the 21.5” screen for the clearer less distorted sound to bounce off the desk or other surface. The speakers’ grills also work as the vent ones. The iMac Core 2 Duo 3.33 21.5” (late 2009) is shipped with a compact aluminum Apple Wireless Keyboard and a new multi-touch “Magic Mouse”, an aluminum remote control is optional and available for an extra cost. Introduced on: October 20, 2009. Processor type: Core 2 Duo (E8600) “Wolfdale-3M”. Video: 21.5″ LED-backlit TFT active matrix LCD, 16:9 widescreen, 1920×1080 pixels max resolution, viewing angle: 178° horizontal and 178° degrees vertical. Webcam: iSight Camera, 0.3 MP, 640×480 resolution. Price: $1399 (Nvidia card aboard); $1699 (ATI Radeon card aboard). The upgrade with the Core 2 Duo 3.33 MHz processor cost $200. Both models with Nvidia card and 500GB drive and with ATI Radeon card and 1TB drive were due to upgrade. 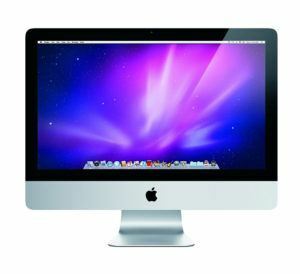 Trade in your old iMac for fast cash: Check on our prices, we pay the highest prices online for your old devices!